Click here for their STP . Both PS and PI are found esclusively in the cytosolic layer of the plasma membrane, of which they represent 8% and 1%, respectively : they are both translocated in the extracellular layer upon platelets activation and in cells undergoing apoptosis , where it acts as a "eat-me" flag. Proteolytic activation of PARs is irreversible and cleaved receptors internalize and are degraded in lysosomes. Therefore, PARs are single-use receptors that probably mediate signaling during pathophysiological or "emergency" conditions when PAR agonists are generated or released. bimatoprost (Lumigan®) is a structural analog of PGF2a-ethanolamide (prostamide F2a), which is formed from the endocannabinoid anandamide by a biosynthetic pathway involving COX-2. The target receptor for bimatoprost and the prostamides appears unique and unrelated to PG- and endocannabinoid-sensitive receptorsref. 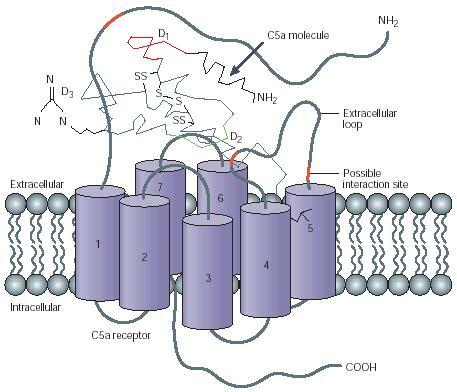 calcium sensor receptor (CASR) (it can homodimerize) (also G iPCR) high Ca2+ ECM parathyroid chief cells, thyroid C-cells, cells of the kidney tubule, bone, colonic crypt epithelial cells (including colon carcinoma cells), brain, epidermis, lens, stomach, pancreas, liver, breast, ovary, placenta, prostate, testis, and bone marrow cells (including myeloma cells) polycations : the lack of selectivity and relatively low potency of these cations for the CaR indicate that charged residues in the ECD of the CaR are critical for receptor activation through electrostatic interactions. Although not perfect, a correlation exists between the potencies of cations at the CaR and their net positive charge density. In addition, recent studies indicate the possibility that the CaRs act as sensors for pHref and L-amino acidsref. Indeed, L-amino acids suppress PTH secretion in vitro, suggesting that L-amino acids are physiological regulators of PTH secretion and whole body calcium metabolism. Abbreviations and acronyms | Medical terminology | Add a link | Translate this site into your favourite language | Softwares | Cite this page!